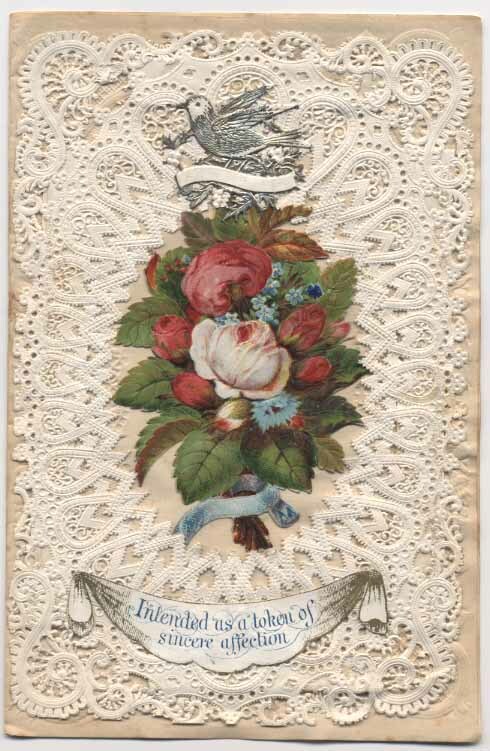 Valentine cards of the nineteenth century very often incorporated flowers, either as the main image, decoration or both. The choice of flower was by no means accidental: each bloom had a meaning, understood (but how well?) by both sender and recipient. 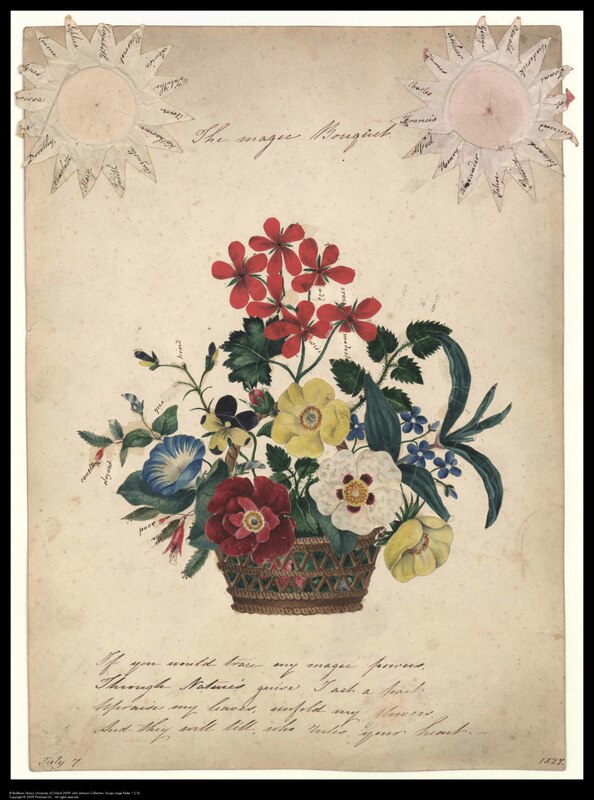 Although red roses are the universal symbol of love even now, pansies are still associated with thoughts and lilies with purity, the meaning associated with most other flowers has been lost over time. A yellow tulip signified hopeless love or cheerful thoughts, but a red one a declaration of love, while variegated tulips conveyed beautiful eyes. Then, there are the mixed bouquets! 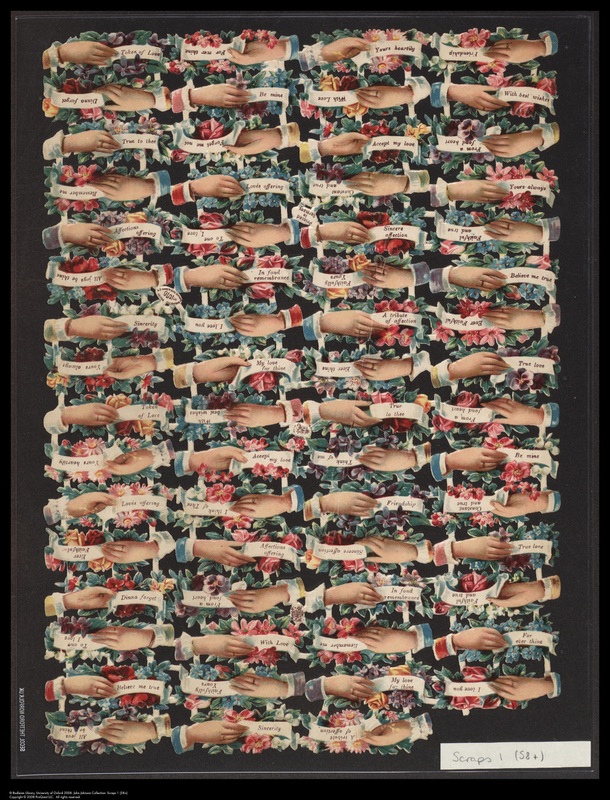 Combinations of flowers pose particular problems to the 21st century viewer. 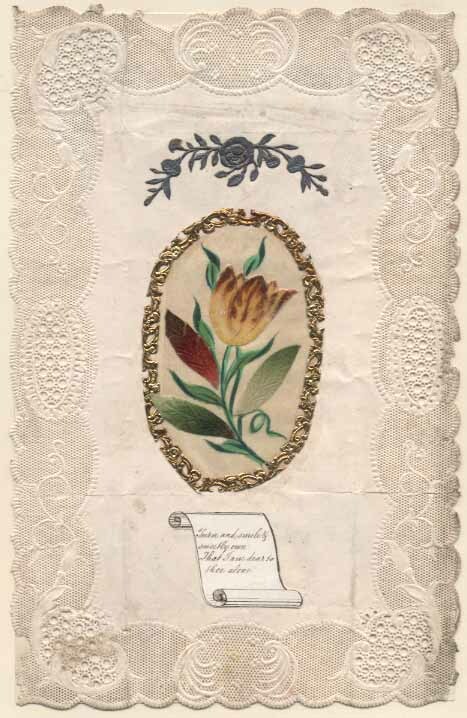 Since most valentines were composed of different elements, the intention could be clarified by the scrap bearing the text, itself sometimes incorporating a flower. 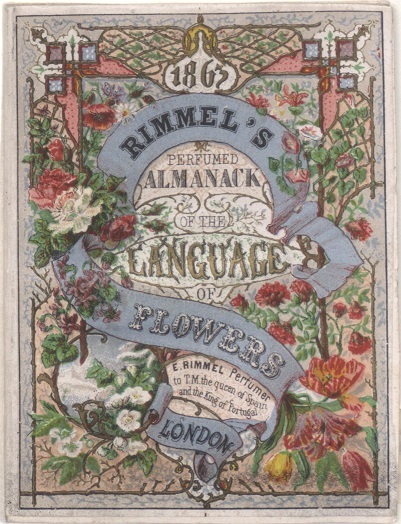 We have also included Mullord Bros’ card game: The language of flowers, which gives a guide to flowers’ meanings in the late 19th century, taken from ‘the best authorities’. Ship matchbooks go back to an era when most people were smokers. Providing books of matches – or small boxes of matches – was looked upon as a necessity rather than as a luxury. 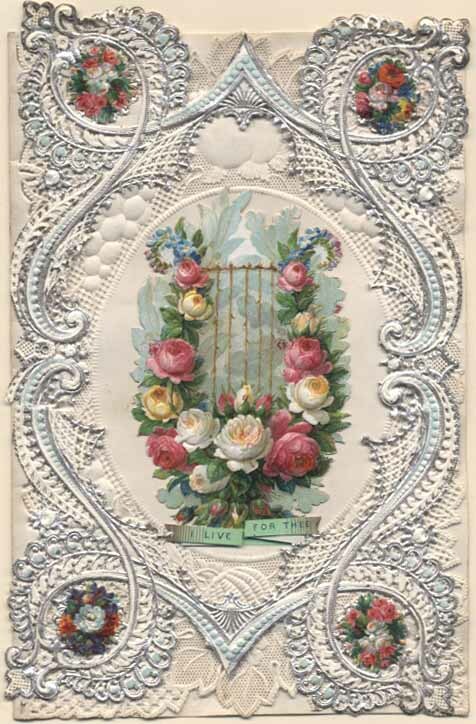 Matchbooks are a commodity that had a short life – when the matches were used up, the empty book was discarded. Many of those used on the ship ended up in the ship’s garbage. A few came ashore, either because there were a few matches remaining in the book, or because they were being kept as a souvenir. Matchbooks belong in a defined time period. With the advent of smoking bans, there are no more matchbooks being produced for dissemination aboard ships, or for most other venues. What is ‘out there’ is the quantum of what there is or ever will be. At this stage, there is a stigma about smoking, and that stigma reflects upon the collection of smoking artifacts, including matchbooks. And the legion of matchbook collectors has further withered in the reality of no new collectibles. When the subject of smoking moves from the despised to the purely historical, these prime examples of ‘ephemera’ should move into the realm of research and ‘respectability’. Their significance – beyond that of a social ‘grace’ – is relevant to design, advertising, and promotion. The French Line examples are a fine example of product advertising, with each ship in the fleet as a ‘product’ and marketed separately. In the 1930s, the Normandie was their high-end product, and was marketed on its own stature and perceived elegance. However, inside the cover, other ships of the fleet are also mentioned, and the examples in the Collection show how the loss of one of the ships in the fleet (the Lafayette) in 1938 led to its deletion from the fleet list. The only other line that appears to have actively focused on each ship as a product was the Norwegian America Line, where the various ‘fjord’ vessels had their own matchbooks. 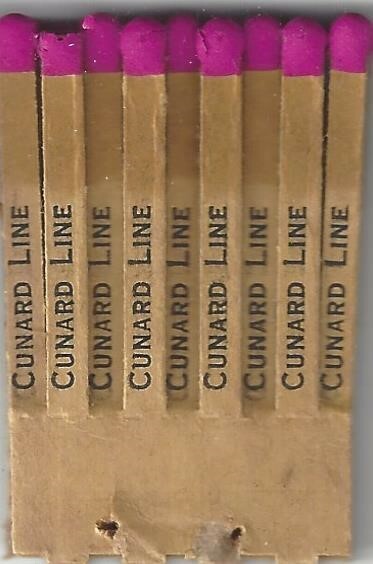 At Cunard, apparently the only vessel to have had its own distinctive matchbooks was the Queen Mary. An example is elsewhere in the Collection. So for the French Line the premise appears to be that the Line was defined by its ships. For the other lines, the assumption was that the ships were defined by the line itself. As ‘Superliners’ the Normandie and the Queen Mary had their own distinct mantles which may explain Cunard’s efforts to define the Queen Mary’s individuality as it faced its primary competitor, the Normandie, for the most elegant and prestigious travel across the North Atlantic in the fiercely competitive 1930s. Note that the collector should remove the matches, because of the risk of them being a fire hazard, although I understand that some matchbook collector purists prefer to have the matches intact. This Cunard example shows why! Where the matchbooks define the line’s own broader self-image, I leave it to future students of graphics and design to use them to interpret those images! The Sayers Collection at the Johnson Collection, Bodleian Library, includes these matchbook examples, as part of a group of some 50 Ocean Liner matchbooks. The match tips have been removed!